Every time I come here, I think, this place is FANTASTIC, why have I waited this long to return? And then the bill comes, and reminds me exactly why. Hands down, Kuruma Zushi is the ABSOLUTE BEST sushi in NYC. Hands down! Problem? They are also the most expensive, right behind Masa (which I never had the pleasure of trying). The omakase here starts at 300, but I’m 99.99% certain that he just charges you whatever he feels like charging you. Every time I’ve gone, the bill is 400 per person, which does not include drinks, tax and tip. Now, I’m certain I don’t eat the same amount every single time I go, so how could the bill be an even 400 every single time? Exactly! 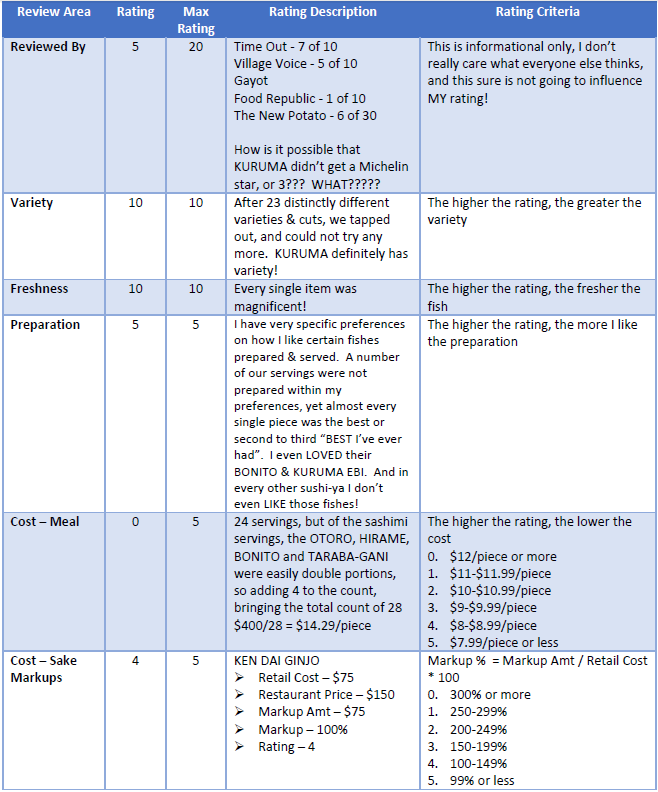 Kuruma, as pricey as they are, have been here for over 39 years. In May of 2017, they will be celebrating their 40th anniversary. How crazy is that? Same restaurant, same location, and same chef for almost four decades! Now that’s lasting power! Insane! Chef Toshihiro Uezu has been a sushi chef for over 50 years, and you can tell that he just LOVES his work. Chef Uezu is also super upbeat, super jubilant, and super entertaining. His English is not perfect, but just don’t be such a snot using big words that nobody understands, and you will be able to communicate fine! He’ll chat about everything and anything, sushi and non. Truly, you can’t help but smile sitting at his bar. 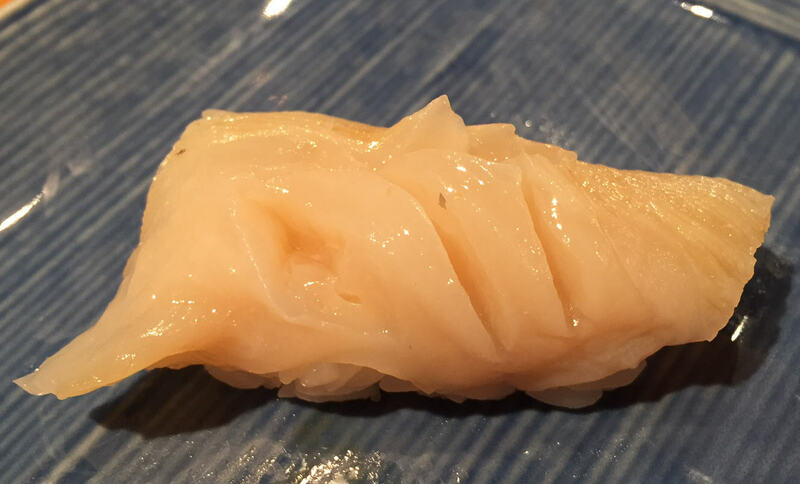 If you’ve been reading my posts, you’ll know that I go on and on about USHIWAKAMARU’s TAKO, about BLUE RIBBON IZAKAYA’s lobster, Kuruma takes the cake for FOUR things! Their KATSUO (Bonito), TARABA-GANI (King Crab), AWABI (Abalone), and KURUMA EBI (Japanese tiger prawn). And they don’t even cheat! 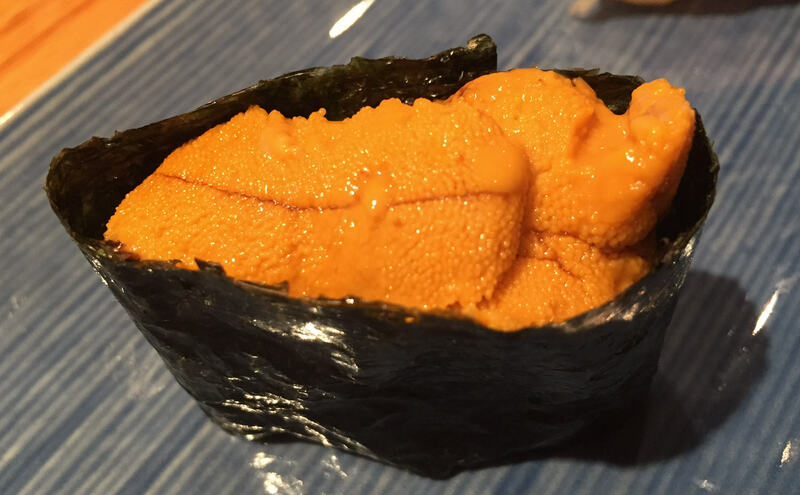 No special toppings like UNI, IKURA, Caviar, etc to make it more appealing, which is what many others do. It is just so blow-your-mind amazing on its own! Let’s talk about our meal! At every sushi-ya that I’ve ever been to, if you get a sashimi round, you are getting a plate or a few small plates of fish. This is the only place I know that serves you sashimi one at a time. And it’s incredible! 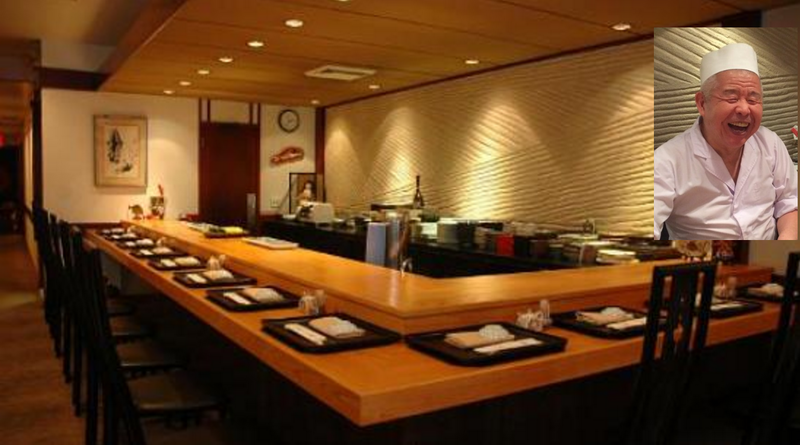 I should also mention, KURUMA is the first sushi-ya in NYC that actually plays traditional Japanese music. Usually, it’s some sort of techno, or eighties music. The traditional Japanese music is really nice and soothing. 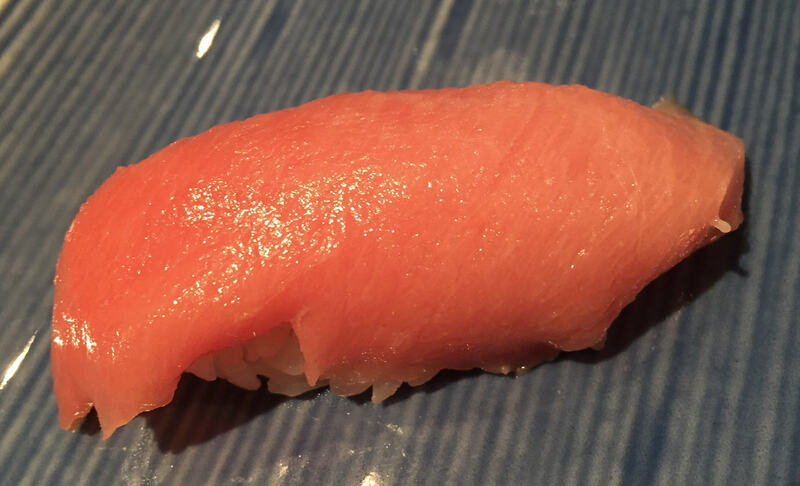 OTORO – This super fatty Tuna melted like butter. It’s insane. (You’re going to hear me say insane A LOT more in this post, so get over it.) I typically don’t love OTOROs because it’s just too fatty for me, making me want to scrub out my mouth after. This one didn’t do that. Lesser OTOROs can also leave a funky tinge of an aftertaste. Again, this one had none of that. 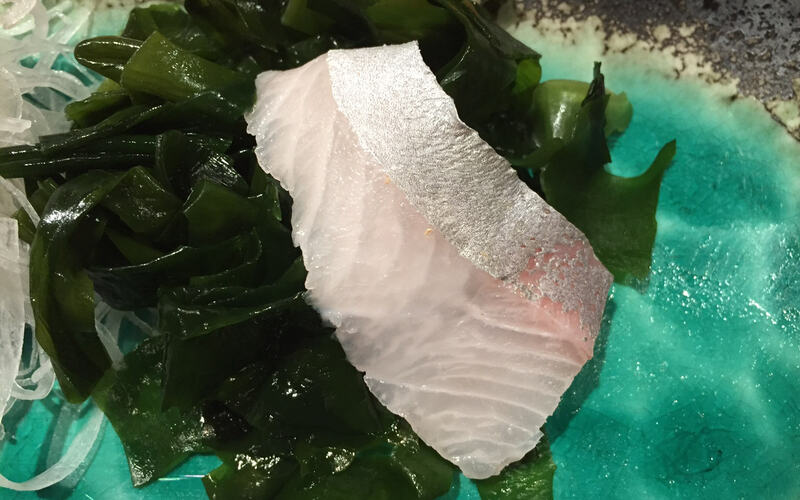 HAMACHI-SUNAZURI – The only time I love HAMACHI, is when it’s the belly, HAMACHI-SUNAZURI. YUM! 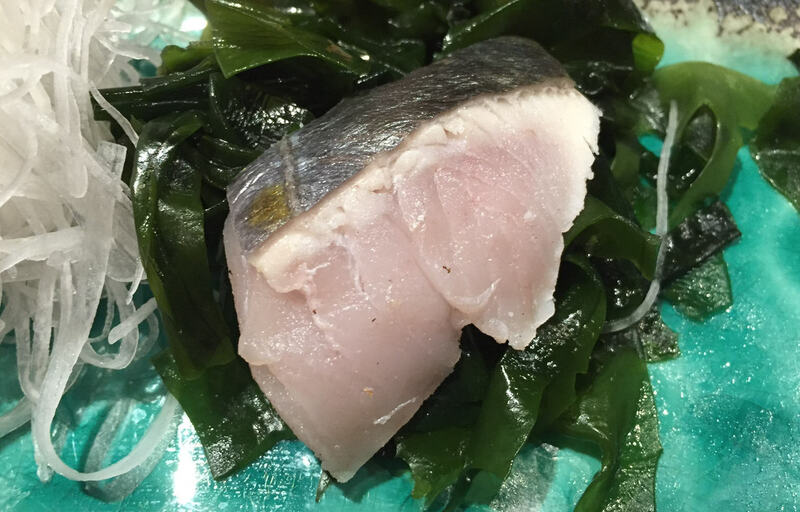 KANPACHI – This was KANPACHI belly. 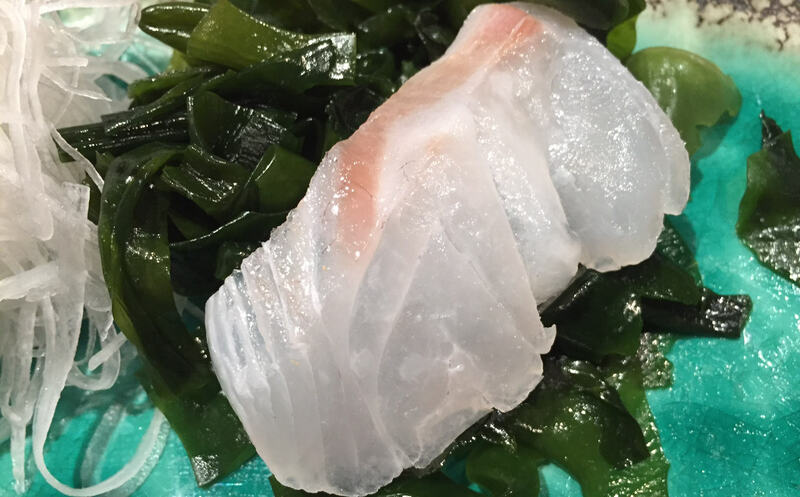 I don’t think I’ve ever had KANPACHI belly before, but I don’t feel like this was any “fattier” than my traditional KANPACHI, it just tasted an insanely fresh, insanely good one. 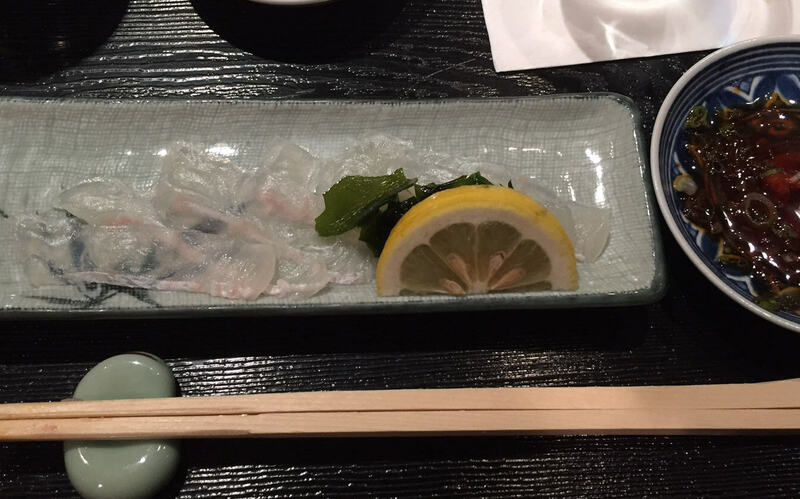 It had a crazy crunch and that very specific gumminess that is so distinctly KANPACHI. That’s how you can tell the SHIMAAJI and KANAPCHI apart by the way. 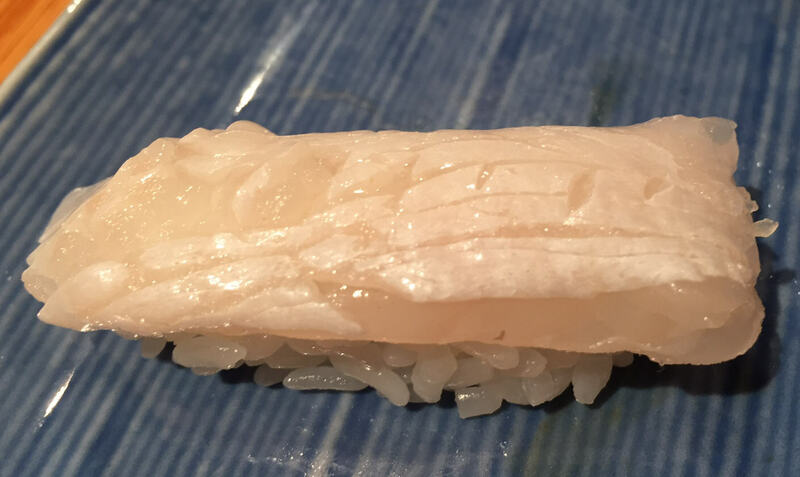 They look very similar, KANPACHI is more opaque, and pinker, whereas SHIMAAJIs are more translucent, but often, and especially with lesser cuts, it’s really hard to tell on just looks. But once you take a bite, the gumminess will tell you what you’re eating. 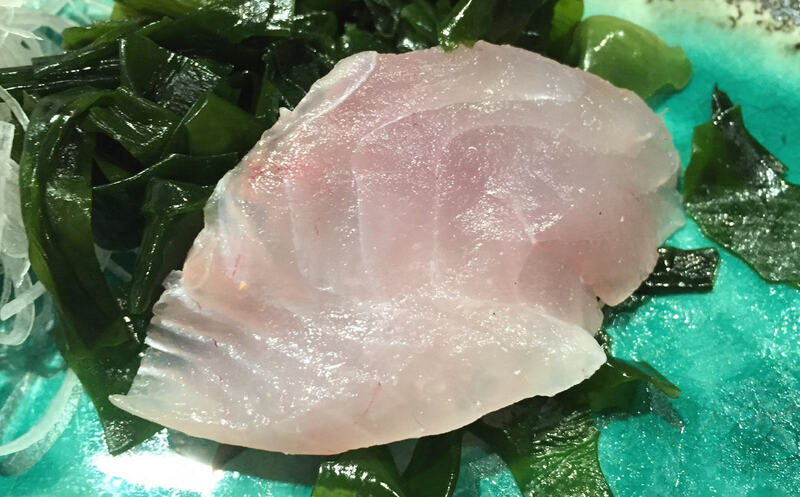 MADAI – True Seabream, one of my top three of the whitefish family. If you’ve been reading my posts, I NEED to have some of the skin left on my MADAI, this one did not. I also prefer to have a little bit of salt and citrus on it, and again this one did not. HOWEVER, despite watching him like a hawk, and knowing there was no squeezing of any citrus, this fish still had a hint of something lemony. It was insane, how did he do that? MAGIC! This was amazing, incredible. KINMEDAI – Golden Eye Snapper, another of my top three of the whitefishes. KINMEDAIs, I prefer to have the skin on, HEAVILY ABURIed (torched) on skin only, and topped with a little bit of salt, hold the citrus. Same as the MADAI, I watched him take this fish out of his tin box, there was no citrus in the box, and no squeezing of any citrus, yet it was definitely citrusy, and infused throughout the cut, and not just topically. Just like the MADAI, this was amazing. I LOVED this. First time I’ve LOVED this, when not prepared the way I prefer. First time! 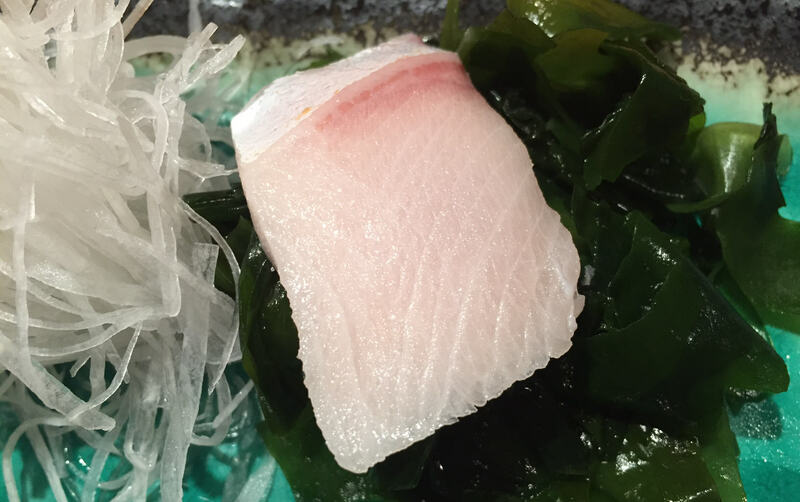 HIRAME sliced super thin and served with PONZU – Really good, really fresh. It had the signature slight chewiness as do all HIRAMEs, thoroughly enjoyable. I should point out now that the staff here is super attentive, or in more crass terms “on-your-a*s”! The SECOND you pick up the last piece of whatever it is you are being served, they sweep in, and collect your plate/bowl/whatever. Seriously, get off my a*s! I find that so annoying. Thank goodness there’s just a handful of items where they serve you on its own plate. I just realized… I don’t have a rating category for “service”. I don’t remember why. I think it was something in the line of, if you’re paying 150-200 per person for food alone, service has to be decent. Either that, OR since I’m at the bar, service is all about the chef, and not so much the wait staff. I don’t remember. Point is, there IS such a thing as OVER-service! SAWARA – Spanish Mackerel served with a heavy ginger and scallion soy sauce. I really dislike SAWARAs as a fish varietal, but this one I don’t hate. Which says A LOT! 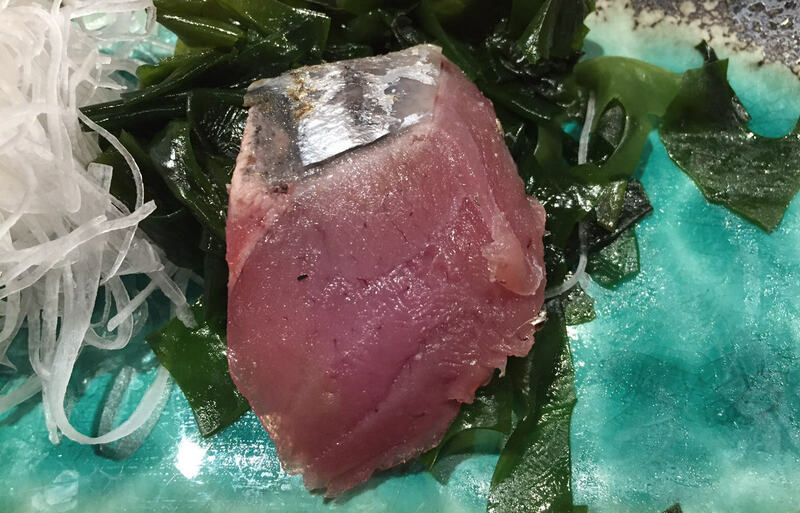 KATSUO – Bonito served with the same heavy ginger and scallion soy sauce as the SAWARA. You know how I dislike SAWARAs, I REALLY dislike KATSUOs. I think KATSUOs is the nasty red-headed-step-child of the Tunas. By the way, I don’t really understand nor agree with the term “red-headed-step-child”. I think red hair is gorgeous. But I didn’t make up the term, I’m just the drone that uses it. Anyway, back to what I was saying. I never met a KATSUO that I liked, UNTIL NOW! WOWZERS this was good! Good, as in, I would actually order this à la carte, GOOD! TARABA-GANI from Norway – I’ve recently raved about the TARABA-GANI from IKI CUISINE. BUT, comparatively, IKI cheats! They have the TARABA-GANI swimming in UNI butter. See what I mean? How can anything not be amazing in UNI butter? 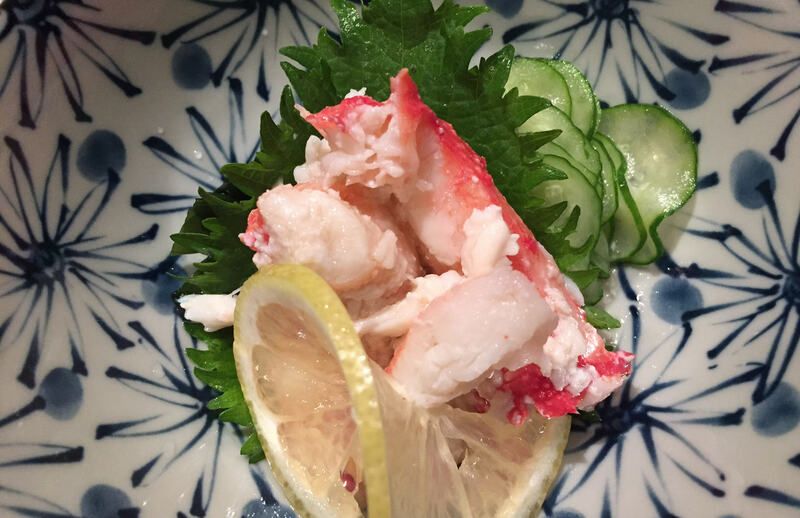 KURUMA’s TARABA-GANI is straight up all about the King Crab, and nothing but the King Crab! And this photo does not do the dish justice. The portion size was ridiculously large, and the crab outrageously juicy. I need to take some photography lessons! Chef drizzled it with some liquid, but I don’t know what it was. It wasn’t any sort of oil for sure, and not anything vinegary either, but no idea what it was. It was a little bit citrusy, but nothing overpowering. This was the most amazing crab I have ever had. Knock your socks off amazing. Incredible! 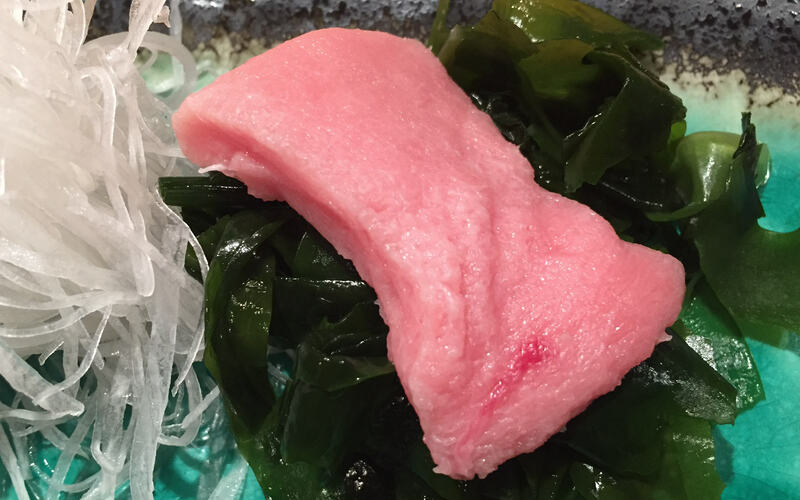 TORO KAMA – Toro from the neck of the Tuna. 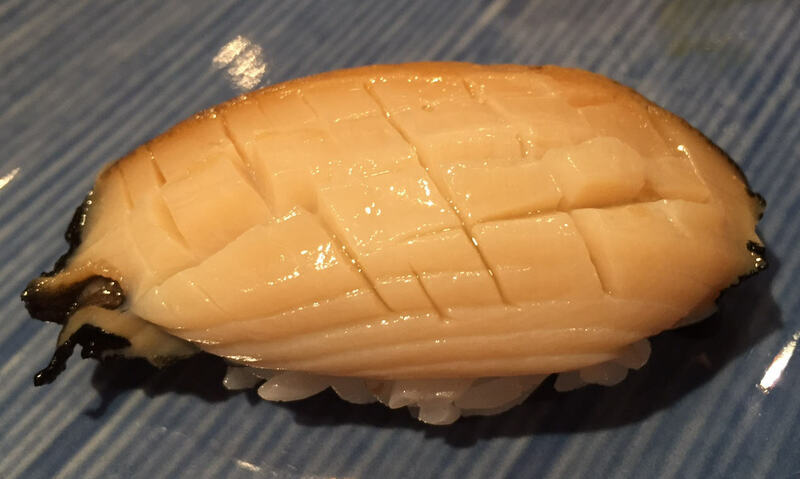 If it’s possible, this was even more buttery than the OTORO sashimi. This one was too much for me. I didn’t feel a need to scrub out my mouth, but it did want more rice. And that’s NEVER the case. 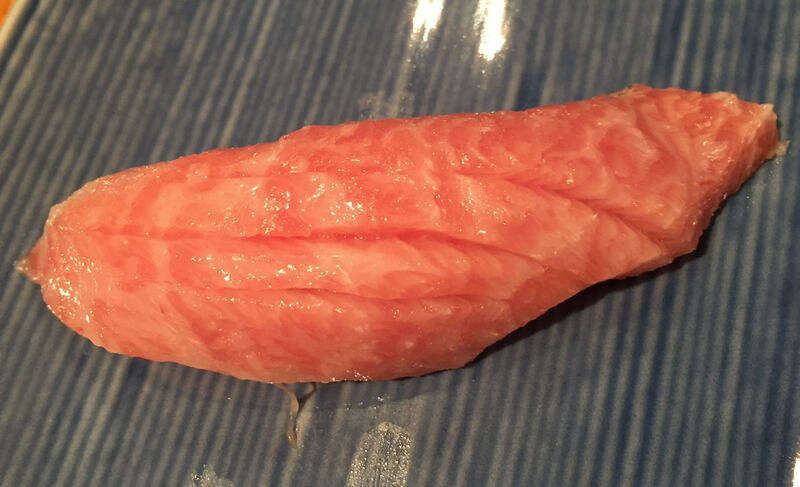 OTORO from the belly – How is it that chef just keeps upping the fat content? And why am I not disgusted? I am beyond confused right now. 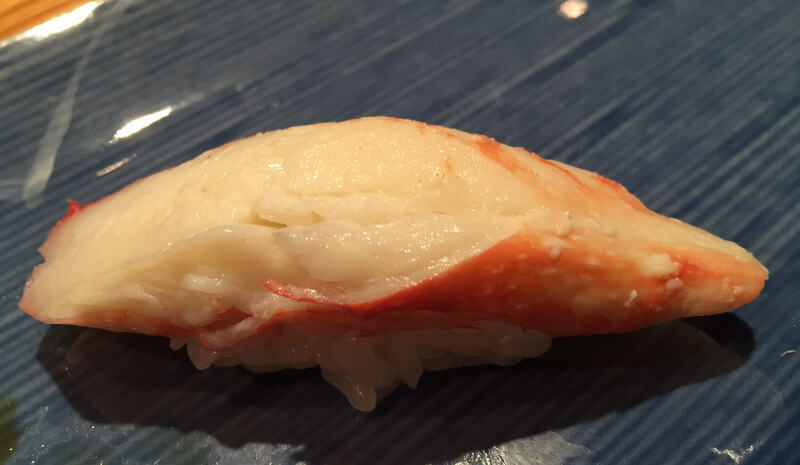 SHIRO EBI – I am a HUGE fan of SHIRO EBI (sweet baby white shrimp). It’s the more rare of the EBIs in NYC. It’s quite delectable. Chef’s SHIRO EBI had a little bit of a citrus hint, which is uncommon, but all around incredible. I’ve always only had my SHIRO EBI topped with soy, and occasionally caviar. The seaweed was super crunchy as well. Another anomaly! I don’t usually get seaweed this crunchy unless the chef torches the seaweed right before serving. I did not see any torching! 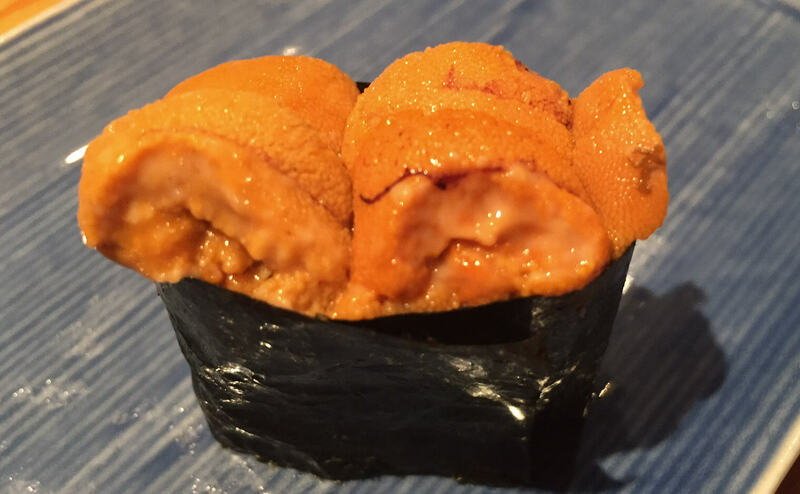 HOKKAIDO UNI – A little hint of nuttiness, and really delicious. 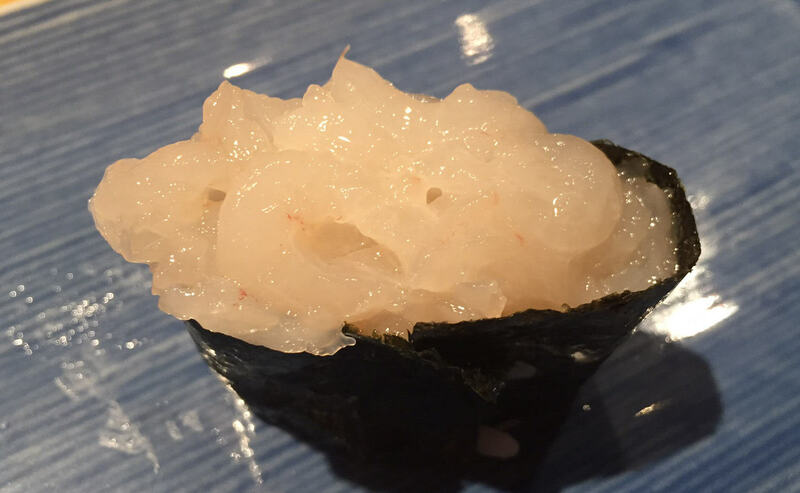 KURUMA EBI – Chef is just changing my view of fish left and right! 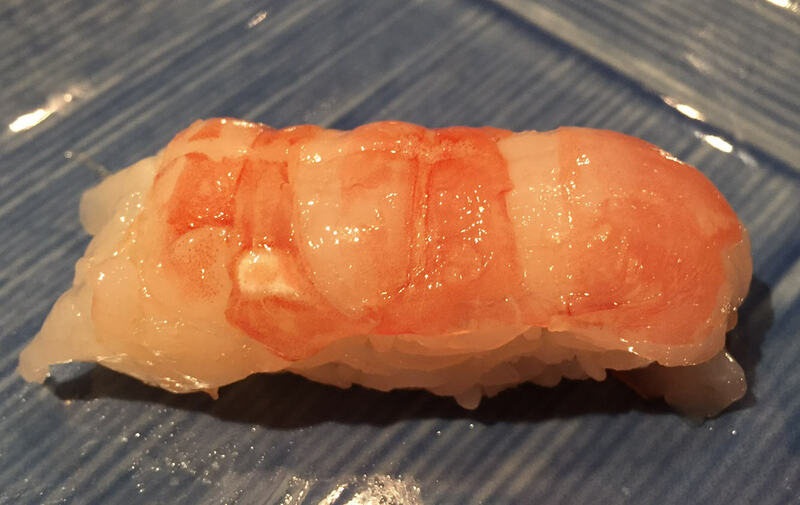 I am NOT a KURUMA EBI (Japanese tiger prawn) fan. Never have been. This one I am a fan of. A really big fan. 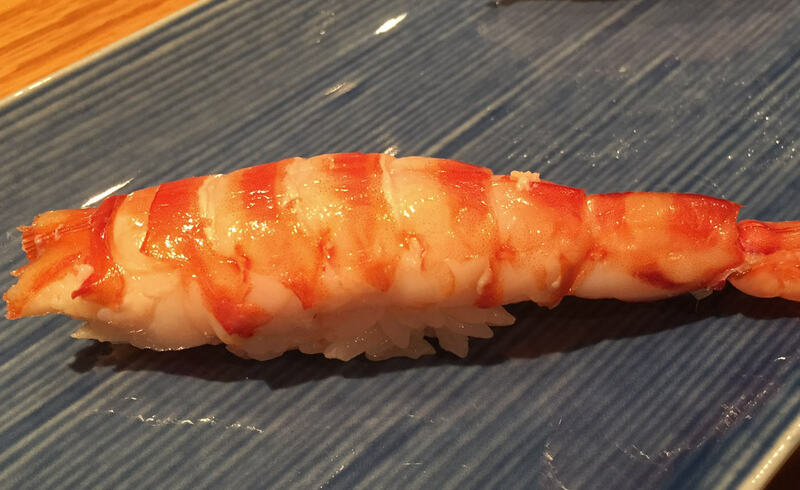 BOTAN EBI (sweet shrimp) – Now this is one ginormous shrimp. Just like all the other fish, this was super fresh, with an amazing crunch. SANTA BARBARA UNI – This took the cake. First Santa Barbara UNI I’ve had this since the winter that was this amazing. Chef says that he orders this every day, and 9 out of 10, it is no good, so he will not serve. Today, we got lucky. This was so sweet, so delicious. 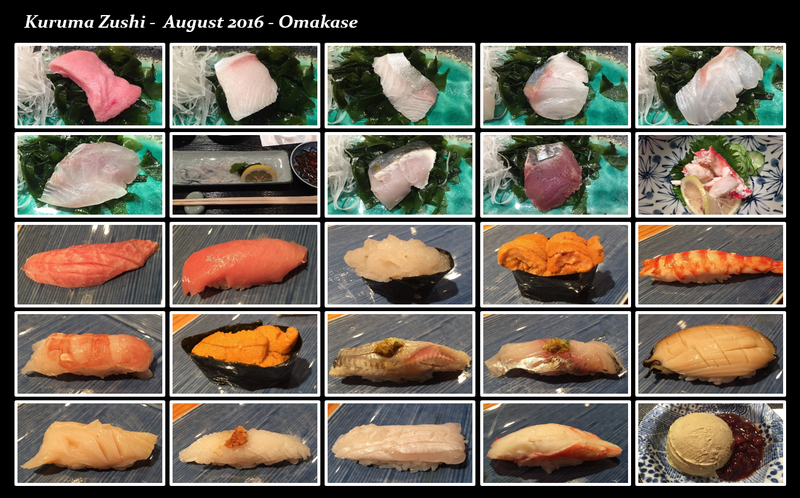 IWASHI – One of my favorite silvers. IWASHI season only has another month at most? Topped with just a tiny bit of ginger and scallion, this was just incredible. 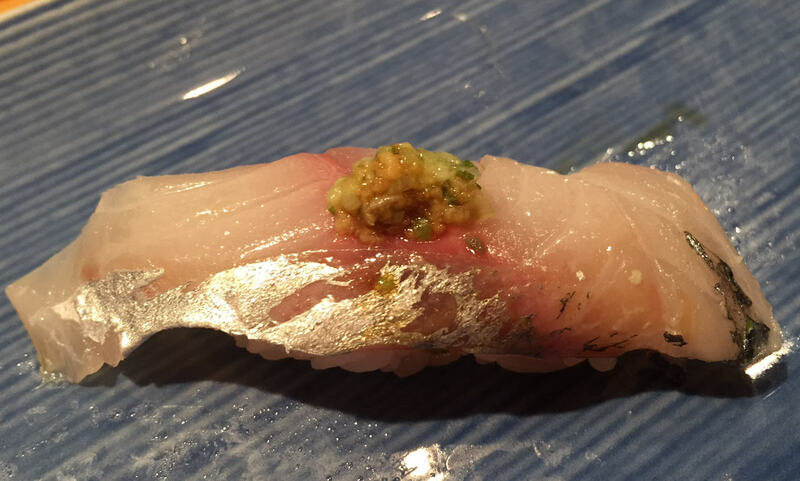 AJI – Same as IWASHI, topped with a tiny bit of ginger and scallion, super scrumptious. 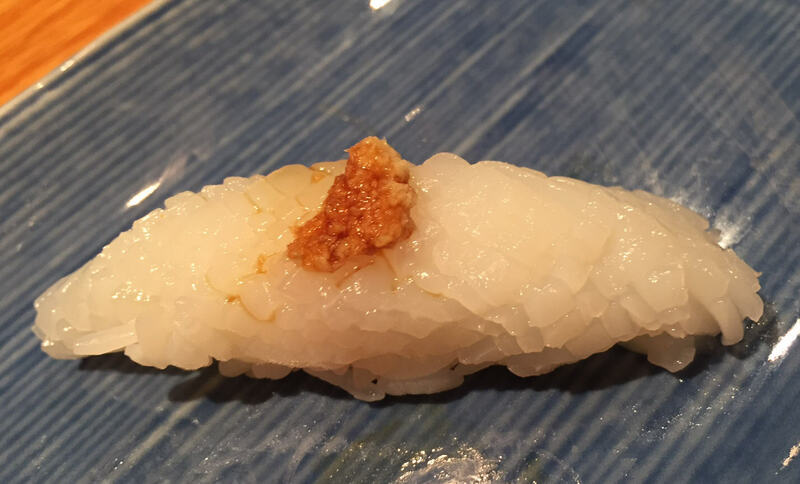 HOKKAIDO TOKOBUSHI – Chef gave us quite the lesson in TOKOBUSHI from different parts of the world, how they compare, and how it differs from AWABI. Whole, this particular TOKOBUSHI looked just like HOKKAIDO EZO AWABI. There is no contest. 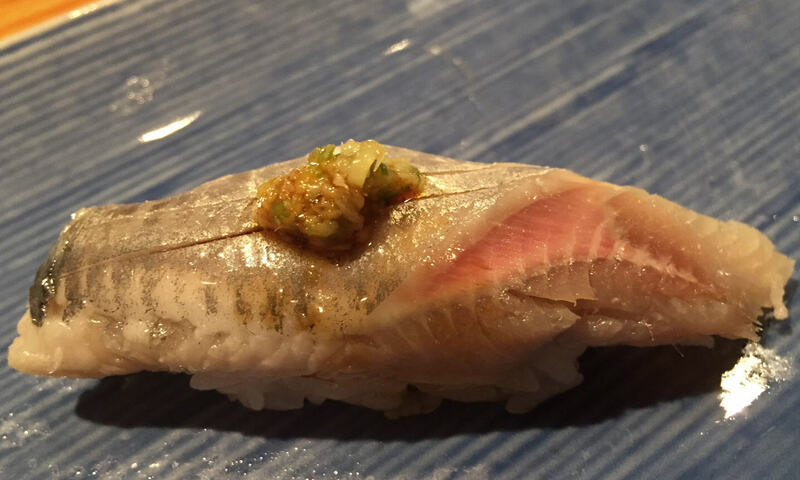 Chef’s TOKOBUSHI is MILES better than any other TOKOBUSHI in NYC. It is served RAW but treated, and lightly scored. The crunch is out of this world. The taste of the sea, so amazing. MIRUGAI – Another in depth lesson! When picking out MIRUGAIs, the color, and “curl” to look for. This was amazingly sweet and crunchy, just incredible. YARI IKA –Very tightly scored, and topped with a little bit of grated ginger and soy. While I LOVE when IKAs are served with a touch of UNI, or IKURA, or both, I rarely like plain IKAs. Because IKAs are PLAIN, and it needs jazzing! YARI IKAS are the top of the line IKAs though, so if any, this is it! Again, how chef is just turning my world upside down. What do I like, and don’t like? I don’t even know anymore! 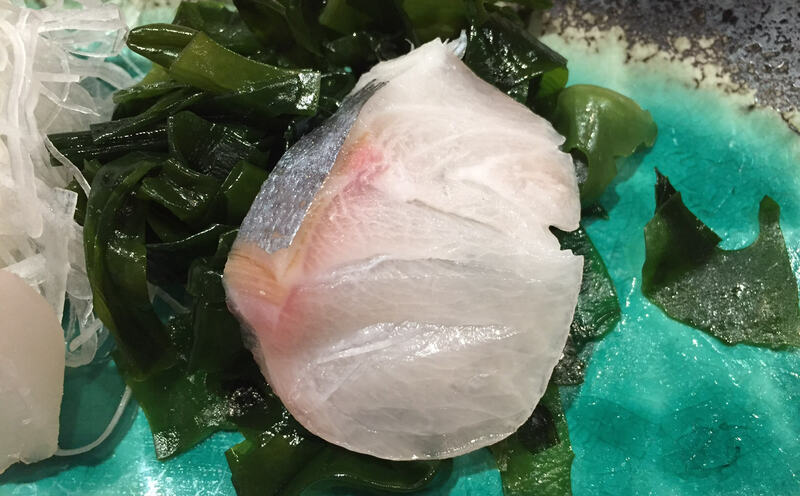 ENGAWA – Same as the other whitefishes we were served, I watched him take this out of his tin can, it wasn’t near any citrus, and he didn’t squeeze or splash anything on this Fluke Fin, yet there was still a hint of citrus. This was scrumptious. TARABA-GANI from Norway – As I said during the sashimi round, Chef’s TARABA-GANI is AMAZE-BALLS!!! Rather than doing the NEGITORO roll, we did a sushi version of the TARABA-GANI to wrap up our meal. Simply delectable. 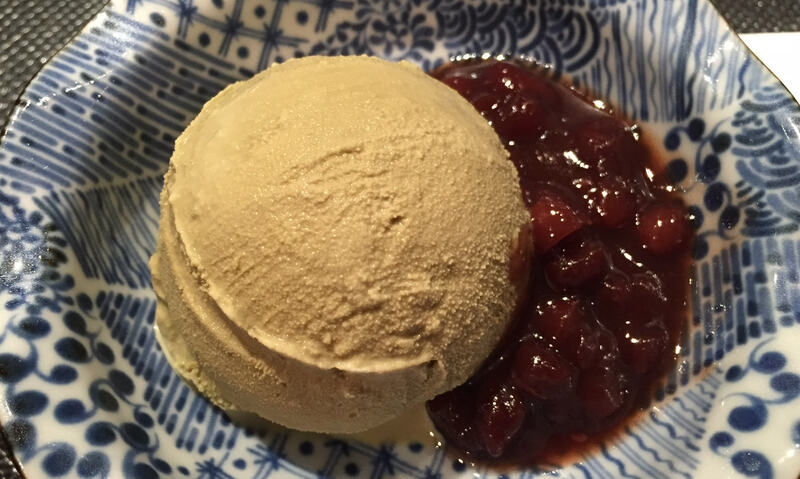 Green Tea Ice Cream with Sweet Red Bean Sauce – This is real green tea ice cream, not the regular store bought or even Häagen-Dazs one. We’re not big into sweets. Can easily go a month without any sweets at all, so we certainly don’t seek it out. But real green tea ice cream is really good, not overly sweet at all, and balanced with the slight green tea bitterness. When topped with the superb sweet red bean paste? YUM!